Lkmediabook - BIGGEST SOUTH AFRICAN MUSIC COLLABORATION EVER TO HONOUR ICON, JOHNNY CLEGG. MUSIC COLLABORATION TO HONOUR ICON, JOHNNY CLEGG. BIGGEST SOUTH AFRICAN MUSIC COLLABORATION EVER TO HONOUR ICON, JOHNNY CLEGG. 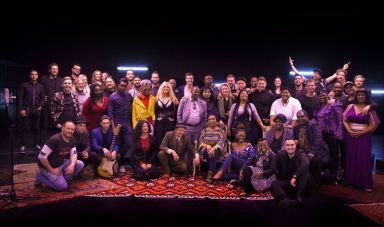 Over 50 prominent artists came together to record a tribute to Johnny Clegg, a true South African legend who has made and continues to make an indelible mark on music history. The song and accompanying video, filmed at the gathering in September, were played to Johnny for the very first time at a private event on 5th December 2018, where he performed for friends and lifelong fans at the luxury boutique hotel, Ellerman House in Bantry Bay, Cape Town. Singer, songwriter, dancer, anthropologist and musical activist, Johnny Clegg’s infectious crossover music — a vibrant blend of Western pop and African Zulu rhythms — exploded onto the international scene and broke through barriers in South Africa. In an award-winning career spanning over three decades, he has sold over five million albums worldwide, bringing people from all backgrounds together. The same evening saw the launch of Friends of Johnny Clegg, a fund created in Johnny’s honour to help alleviate the education crisis in South Africa. All proceeds from downloads of this special version of “The Crossing” will go toward this fund. These proceeds will be distributed by the Click Foundation, which targets young learners with an online phonetics-based programme in centers across the country, ultimately aimed at creating a better future for the youth of South Africa — a cause close to Johnny’s heart. On 10 September 2018, many of South Africa’s most popular and influential artists flew into Cape Town to share their time and talent in recording their own version of Johnny Clegg’s “The Crossing” at Mothership Studios. The song was produced by Theo Crous and mastered in Los Angeles by Lurssen, a multi Grammy award-winning studio. Emotions were high, with smiles all round and a wonderful sense of camaraderie amongst fellow artists and friends, brought together by their desire to pay tribute and express their love and admiration for the great Johnny Clegg. Watch the official music video directed by Carien Loubser of Brainwave Productions and the video of an unforgettable evening at Ellerman House by Etched Space. For behind-the-scenes images of artists at the recording and images of the handover, click here. The song is available for download on all digital platforms including Apple Music, iTunes, Google Playstore, Spotify and Deezer. All proceeds go directly to the Friends of Johnny Clegg Fund. For more information on how to support the cause, please visit the website www.friendsofjohnnyclegg.co.za. Photo taken at Mothership Studios, Philadelphia by Anelia Loubser.